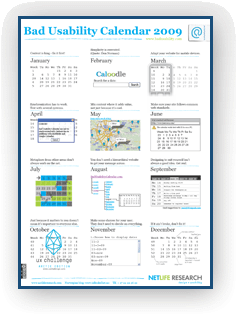 Now to what has become a true tradition by norwegian UX-experts at Netlife Research; the yearly "bad usability calendar" for 2009 is unvealved today. This year they put their critical finger on mash-ups, mobile devices, synchronization and the good old hierarchal website. If you are interested in UX you should take the opportunity to hear some great people speak and see a fantastic part of the world: Svalbard an island north of Norway - almost at the North Pole! The UX Challenge conference is held by Netlife Research from October 7 to 11. Written on 13 January 2009.